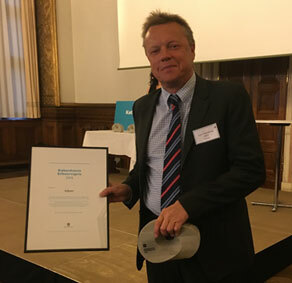 Cleantech company INFUSER has won the Copenhagen business prize - København Erhvervspris - for innovation. Infuser produces ground-breaking air cleaning system based on research from Department of Chemistry at the University of Copenhagen. The company INFUSER was Copenhagen's number one in innovation at the first ever presentation of the new business prize, Københavns Erhvervspris. The cleantech company manufactures innovative air cleaning systems based on a technology from the University of Copenhagen. In the space of a few years, INFUSER has attracted over DKK 70 million in international investments, and opened offices in several countries. In March, the company's products were presented at the Danish embassy in Beijing. It is Professor Matthew Johnson from the Department of Chemistry, who invented the so-called GPAO method, which mimics the atmosphere’s natural self-cleaning properties. The technology is owned by the University of Copenhagen, and Infuser has a license to use it. INFUSER's collaboration with the University of Copenhagen goes beyond a license. The company works very closely with research environments at Department of Chemistry and has therefore made it a priority to be situated close to the department in the Copenhagen Science City. Earlier in the year the cooperation resulted in the opening of Europe's most advanced development laboratory for the analysis of air quality, Infuser Cleanlab.